The January/February 2017 issue of the Chesapeake & Ohio Historical Magazine has an article by Karen Parker titled "150 Gondolas Were Also Pulpwood & Tie Cars." It describes how the C&O converted a number of 50-ton low-side gondolas into pulpwood bulkhead flats. This article provided inspiration for several new projects. I have one of the old Athearn Blue Box gons lettered for the EL that I weathering and detailed about one hundred years ago. The car was actually one of the first weathering projects I ever tackled. I've held onto all these years thinking it would eventually be put in service on the railroad. Of course, I found out a long time ago that there is no prototype for the car. Still, I though I might find some use for it. And I had actually been looking at it just prior to the arrival of the C&OHS magazine. Then I found a shot of one of the converted C&O gons and the inspiration hit- I could take that old Athearn gon and convert it into a pulpwood flat for the home road. Cutting down the sides would be fairly simple as would scratch-building some new ends. While looking for photos of pulpwood flats on the internet, I came across some shots of Tichy's pulpwood car. There were also photos of the ends of the car that are offered separately. That settled it- I was going to use the Tichy ends on the Athearn car. While shopping for the ends, I also took a good, long look at their pulpwood flat. It's one of those cars that I have always thought looked great, and I planned to build one some day. So as long as was ordering the ends, I decided to pick up a couple of the flat cars. The first thing I noticed when I opened the kit is the number of parts. Yikes! I've assembled some the the smaller Tichy parts/kits in the past, but never one of their freight cars. As you can see in the photo below, there's a bit to it. It's going to take a little longer to assemble the two cars than I had originally anticipated. But they do look to be neat kits. Finding a place to add weight might be a challenge. These cars may end up permanently loaded in order to add enough weight to get them to perform OK on the railroad. Another concern are the grab irons. The photo below shows how everything came out of the box. Note that the sprue is missing a number of the individual grab irons and they appear to have broken off. I'm hopeful that each sprue contains a number of extra pieces and that I'll have enough good ones to complete the kit. While I'm certain that Tichy will provide replacements, it would be a hassle to have to go through that process. So now I have two Tichy kits to build and two bulkhead end kits to build. Yep- I picked up another one of the old Athearn cars at Tim's Trains and Hobbies in Covington, KY. We'll see how all of these turn out. 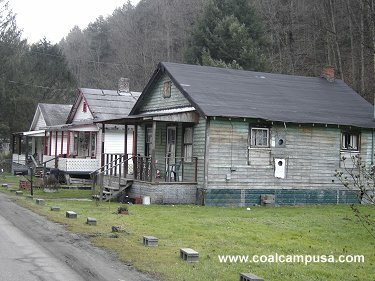 This past December I started work on the two company houses that will be located at Logan, WV. For a long time, I had debated just what type of structures would look best in this area. 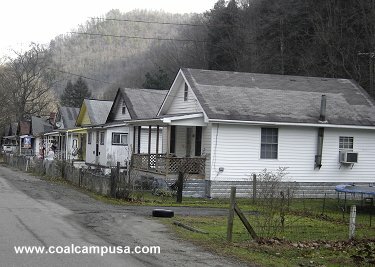 Would it be a couple of company houses and a mobile home? Just one company house and a mobile home? Or just a mobile home? I finally arrived at the decision to include the two homes in the photos below. The more I studied these photos, the more I realized that there were some really neat features of each that would be cool to model. For instance, note the air conditioner in the window of the first house. In the picture of the second house, note the boarded up window above the porch roof and the porch railing that has been made out of 2x4's. It's likely that original railing either rotted out or was broken up at some point and was replaced with a simple design that was easy to install. The first house has gutters and downspouts which are absent from the second one. And note that both structures have siding on the foundations that is intended to represent concrete blocks. Using the dimensions of Grandt Line windows, I drew up a simple scale plan for the house. Using thin cardboard, I cut out a mock-up to see how it would fit into the area. All seemed good at this point, so I cut out the sides and ends using Evergreen clapboard siding. The windows and doors were installed on the first house as they would be painted the same color as the siding. On the second house, I painted the doors and windows a weathered black color. I also painted a number of pieces of 1x6 to use for the trim. At this point, the houses appeared as they look in the photo below. The green color that I used was initially too dark, so I repainted the house with a lighter shade. And even that was too dark, so I lightened everything up with a very diluted coat of Vallejo Aged White. Now it was time to see how they would fit into the scene. As it turned out, there really wasn't enough room in front of the houses to include the porch, a small yard, and the road between the yard and the track. Sigh. I had to come up with another plan. Should I just skip the road and have a path back to each house? Even then, the houses really didn't sit the way I wanted them to in the scene. The foundations would have to be too high due to the contour of the hardshell. Well, this was enough to sap the inspiration altogether. The houses went into a box for later. Fast forward to an op session in early February. I had placed the houses on the layout as a way to show some progress in the area. While looking at them with Ed Swain, I told him about the issue with the lack of depth. I mentioned that I would have to cut out the hardshell and redo the contour of the scenery in order to get the space I wanted and that seemed like a bit much to do for this scene. He gently prodded me by saying that it wouldn't be that big of a project and that he had done it in several areas on his beautiful Pennsylvania layout. Well, that was just the inspiration I needed to get back at this project. By the end of the next day, I had already cut out the hardshell- see below. Now I would have the room necessary for everything I wanted to include in the scene. The next step was to start construction on the porches. These would have to be build and painted prior to being mounted to the houses. I originally intended to build the diamond lattice seen on the porch on the white house. It appears to be made of pressure treated lumber similar to what you'd find today at a big box home improvement store. I remembered an article on building a four room C&O style cottage that Bob Hundman had written in Mainline Modeler many years ago. In the article, he described how he made the lattice out of 2x2 strips. I went so far as to buy some more Evergreen scale 2x2's and lay out how the jig would be built before I realized just how much work this would be. Sigh. Now I needed to come up with another railing design for this house. Both houses went back into the box. Sometimes it takes a lot of inspiration- at different points in time- in order to get a project completed. Yesterday, Division 7 of the NMRA held its annual Spring Flea Market and Trade Show. It's always well attended and offers a great opportunity to pick up some slightly used equipment. John Miller was there selling some of his excess stuff and I was able to get an Atlas U36C in K&LE paint. The photos below shows the new loco on the home rails. This unit will be used on grain train run-throughs once a new decoder has been installed. It will be great to have some K&LE power on the railroad. John also had a U30C for sale at a great price and I just couldn't resist the temptation to add another one to the loco roster. A quick trip through the paint shop and the addition of a new decoder and this loco will be ready for service. All in all, a successful trip to the flea market! The Horse Car Rides Again! The infamous K&LE horse car is on the road again. It was last spotted on the Denver Pacific several months ago. This past Saturday, though, it showed up on the Virginian's Deepwater District. In the photo below, the car is rolling across the Deepwater Bridge over the Kanawha River at the tail end of VGN No.73. After crossing the bridge, No. 73 rolled into Alloy Yard on the Virginian & Ohio. The car is seen below passing DB Tower as the train moves onto the V&O. While the rascals weren't anywhere to be seen around No. 73, it's a sure bet that they had something to do with this car being on the train. And in case you're wondering who the rascals are, see this post on the blog: http://cwerailroad.blogspot.com/2016/01/rascals.html.